The answer is: Blinky, Pinky, Inky and Clyde. Please phrase your response in the form of a question. Henry's articles are an excellent resource for increasing your JavaFX skills in the context of building a fun video game, so check them out! A JavaFX "Picture Puzzle" app that is integrated with Facebook is featured In a blog post by Sharon Zakhour. Not only is it graphically pleasing and smooth operating (wasn't that a song performed by Sade? ), but it "lives" in Facebook, and makes jigsaw puzzles out of your Facebook friends' profile pictures. It uses the Facebook API, and it was developed by Sun. By the way, if anyone knows whether the source code is available, please post a comment, as it would be a great learning example. Check this JavaFX Facebook app out and puzzle all of your friends! :-) That was lame, but it's Friday. While checking my email today (jim.weaver [at] javafxpert.com), I received a request for feedback from Henry Zhang on a game that he had written in JavaFX. My feedback, Henry, is that your Pac-Man game ROCKS! Check it out, and please give Henry some feedback! This year I had to miss Devoxx 2008, but really wanted to go. Not only is it a great conference, but this year it is the first major conference since the JavaFX SDK 1.0 was released, so there are some great JavaFX sessions and speakers on the agenda. So, in honor of the Devoxx conference and the excellent leadership that Stephan Janssen provides to it, I've created a game in JavaFX. I'm not a game programmer nor am I a graphic designer, and I didn't enlist the help of either for this quick effort. With those disclaimers, and the hope that Stephan Janssen will take this in good-natured fun, I give you: "Whack-A-Janssen", styled loosely after the old "Whac-a-Mole" game. Click on the Launch icon to run it as a Java Web Start application. To play the game, simply click the Start Game button and then click on Stephan's faces when they pop up. While the game is in progress the Start Game button changes to Stop Game. If all three faces appear, the game is over and the Start Game button reappears. * having some good-natured fun with Stephan Janssen of Devoxx. text: bind if (gameTimeline.running) "Stop Game" else "Start Game"
Enjoy the conference if you're attending, and this very simple and lame Whack-A-Janssen game! I've featured Silveira Neto's JavaFX work (play?) in a couple of recent posts, and it appears that he's had gaming on his mind lately. Silveira is a CS student, CEJUG member and Sun Campus Ambassador at Federal University of Ceará. 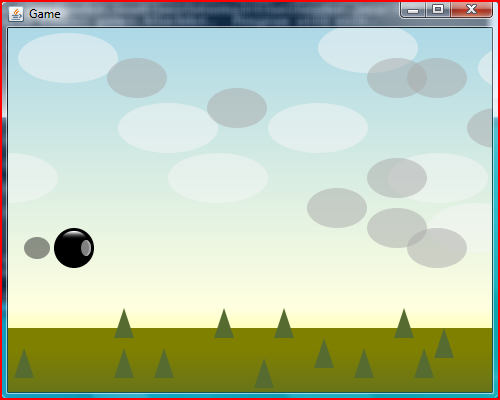 His latest creation, shown above, is a game in which the player tries to vacuum up the dirty clouds with a sphere-shaped cleaner. It demonstrates several techniques in JavaFX, such as creating a side-scrolling game, capturing keyboard input, and ascertaining when a graphical object intersects with a pixel in another graphical object. You can see more information, including the source code and a YouTube video of the game being played, from Silveira's blog post. In a prior post, Silveira discusses how to create a side-scrolling game in JavaFX, showing the classes that he's building to support it.